I just finished writing a book with the Ballards (Lutheran ministers turned Catholic) called What the Saints Say About Heaven…one of my co-authors included an old examination of conscience as an appendix. To my amazement it listed under sins ridicule of others, sarcasm, and even enjoying hearing others criticized! This occasioned a general confession of 73 years of these sins! (In case you are a younger Catholic and don’t know, a “general confession” doesn’t mean you detail 73 years of instances of a sin. That might bore the confessor. You just say “I want to confess 73 years of doing “x”. It sure lightens the load of guilt! While waiting on line for confession I thought of how Kierkegaard wrote that instead of gossiping about the sins of others we should weep for them. Now, by gossip, we don’t mean necessary conversations involving the faults of others for the purpose of helping them or dealing with them. What is meant is indulging in the details of the flaws of others to make oneself feel superior and to almost gloat. At least that’s the way I do it. 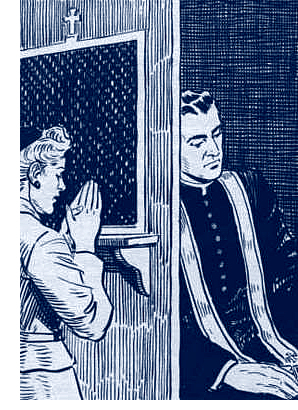 At the last minute I asked in the confession: “probably making sarcastic self-deprecatory remarks about myself is also not so good?” My confessor suggested that this comes under lack of love of self which is preliminary to love of neighbor as oneself. This reminded me of one of my best thoughts about marriage – that we sometimes go from idolizing the spouse, to despising him or her as a fallen idol, whereas it is better to see the other not as an idol at all but as a funny little struggling creature, and ourselves that way also! They say we should not only pray the mercy chaplet but have a whole mercy spirituality. The ideas in this blog could be a start, eh? Dr. Ronda has many free e-books and audios on her website rondachervin.com. If you go to her website and read or listen and then want to correspond with her she will be available. Her schedule does not permit, however, responding to comments on the Blog, though she enjoys reading them.